A moon is a body which orbits a planet. The Earth's Moon (sometimes known as "Luna") is a natural satellite orbiting Earth at an average distance of about 238,000 miles (380,000 km). The Moon is unique in the solar system in its large relative size compared with the Earth. The Moon appears from the Earth to be the same size as the sun, in perfect artistic symmetry, unlike any known other planet-moon system. Moreover, unlike most planets in the solar system, Earth has only one moon. And the Moon has two more remarkable artistic attributes: (1) it rotates and revolves in a way such that only one side is ever visible to the Earth (due to tidal locking) and (2) its side that faces the Earth is smooth, while the side that remains hidden is jagged. To those on Earth the Moon appears as an artistic disc that goes through phases in which greater or lesser amounts of the side lit by the sun are visible from Earth. Atheistic science has proposed a number of naturalistic theories to explain the Origin of the Moon, including a second planet colliding with Earth or even a second moon colliding with the first. None of these atheistic theories of origin is plausible. The Bible explains that the Moon was created separately on Day Four along with the Sun and stars. The Earth's moon has several striking characteristics. To many Christians, these characteristics appear as "clues" or "hints" left by God for men to discover. The Moon appears to have approximately the same size as the Sun when viewed from Earth. This creates a unique symmetry and phenomenal solar eclipses. The Moon is just far enough away from the Earth to appear the same size of the Sun. In precise terms, the ratio of the apparent diameter of the Moon to that of the Sun is on average 0.97 with a variation (due almost entirely to the eccentricity of the Moon's orbit) of roughly ±0.05. Of the known satellites in the Solar System, only three others exhibit the phenomenon of being close in apparent size to the Sun when viewed from their parent planet. These are Saturn's moons Prometheus and Epimetheus (with average diameter ratios of 1.03 and 0.95) and Uranus's Cordelia (1.08). Given the figure of approximately 170 known planetary satellites in the Solar System (though the figure regularly increases with new discoveries), this gives as an empirical probability for the phenomenon of 4/170 or 2.4%, which is not inconsistent with the theoretical figure. It should be noted, however, that by virtue of the planets' distance form the Sun, these eclipses would appear very small in the sky, and would be nothing like as spectacular as a total solar eclipse on Earth. The Moon presents the same side to Earth at all times. That means that the rotation of the Earth offsets the separate effects of lunar revolution. Physical explanations rely on tidal locking, asserting that tidal forces on Earth caused a bulge on the Moon, thereby creating a drag on the rotation of the Moon until the same side always faced the Earth. In fact, current tidal forces exerted by the Earth on the Moon cannot account fully for its bulge or egg shape. The current scientific consensus is that the Moon originated from a collision early in Earth's history which created an orbiting ring of debris from the iron-poor surface of the planet which eventually coalesced into the moon. The Moon could never have been closer than about 11,000 miles or it would have been broken up by tidal forces. If the rate of recession stayed constant at 3.8 cm per year, it would take 9.6 billion years for the lunar distance to migrate from 11,000 miles to the present distance of about 240,000 miles. However these assumptions are very inaccurate as the rate of recession would definitely not be constant over the past 4 billion years. Astronomers assume that crater impacts are a reliable indicator of the age of a celestial body. True to the form and principles of uniformitarianism (as applied to astronomy rather than to geology), any such estimation relies upon uniform constants and weather/erosion trends. Recent research into crater impacts on the moon suggests that many of the assumptions previously made are unwarranted. Bonnie Buratti of NASA's Jet Propulsion Laboratory has asserted that space weathering "takes place very rapidly on the Moon." Peter Brown of the University of Western Ontario insists that there is no absolute criteria for the dating of craters. Danny Faulkner of the Institute for Creation Research has observed that many of the lunar maria contain ghost craters, or craters that the lava flow that produced the maria seem to have filled only partially. In the deep time scale required by uniformitarianism, the ghost craters are the result of impacts that occurred as much as half a gigayear before the crust-fracturing impacts that caused the lava flows. This is not a reasonable assumption, because any impact strong enough to crack the crust should have obliterated any craters previously extant. Faulkner thus concludes that the impacts that formed the ghost craters, and those that let loose the lava flows that formed the maria, occurred within days of one another and were probably part of at least one system-wide catastrophe involving a narrow stream of meteoroids and/or comets that delivered a concentrated bombardment of the Earth and Moon in a short interval. Faulkner assumes that this system-wide catastrophe occurred during the year of the Great Flood. But in 1984, Russell Humphreys, then at the Sandia National Laboratories, developed evidence suggesting different dates entirely. Specifically, the Project Apollo exploration teams brought back many samples of basalt (an igneous rock) and brecchia (pulverized meteor-impact remains). Geologists analyzed both types of samples and found evidence that each type of rock had once been in a magnetic field far more powerful than that which the Moon has today. Using his model for the creation and decay of magnetic fields, Humphreys determined that the basalt had been laid down about 370 years after creation, and the brecchia had been laid down 1840 years after creation, or about 190 years after the Flood. These findings clearly suggest that the Moon, and presumably all other bodies in the solar system, have been subject to two separate system-wide bombardments, one occurring in the second or third generation after the fall of man and the other occurring well after the Flood. The gravitational force of the Moon causes the ocean tides; these tidal forces have other effects as well. These tidal forces have the effect of creating resistance which slows down the rotation of both objects. In the case of the Earth, the result is that the Earth's rotation slows on the order of one millisecond per century. The Moon's rotation is locked in to its period of revolution, and the same side of the Moon always faces the Earth. The phrase "the dark side of the Moon" is inaccurate because the Moon does rotate relative to the Sun, with the same period as its period of revolution, once every 29 days. Our view of the Moon from the Earth always shows the same side of the Moon, with the same markings and features. When the Moon is full, the entire side that faces us is experiencing lunar "day" and is lit by the Sun. Two weeks later, when the Moon is new, the side that faces us is experiencing solar "night" and is unlit (and virtually invisible). The far side of the moon is far more heavily cratered than the near, and the predominant type of cratering is consistent with brecchia-forming meteor impact. This would suggest that the far side suffered its bombardment in the latter of the two catastrophes that Humphreys suggests that the Moon has suffered. Due to a slight "wobble" in the lunar motion called libration, we actually see a little bit more than half of the Moon's surface; sometimes it is turned a bit one way and sometimes the other. 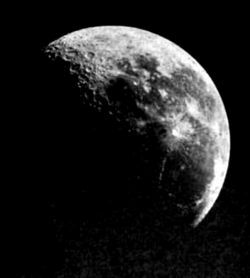 However, nobody had any idea of what the far side of the Moon looked like until 1959, when a Soviet satellite photographed it and relayed pictures back. The "old Moon in the new Moon's arms"
The effect known as "the old Moon in the new Moon's arms" can often be seen when the Moon is a narrow crescent. Within the intensely bright crescent, a dim and mysterious view of the entire circular moon is seen. The effect is also known as earthshine because it is light from the Sun reflected off the Earth to the Moon and back that lights up the darker portion of the Moon. The bright crescent is lit by the Sun and is in full daylight. The rest of the Moon is not lit by the Sun; but an astronaut standing in this area would see a "full Earth" dominating the nighttime sky, lighting it up by its earthshine. The brightness of Earthshine, and hence the visibility of the old Moon in the new Moon's arms, varies. When the Earth is covered with clouds, or when there is a lot of snow-pack on the side of the Earth facing the Moon, the Earth is a white and bright and the Earthshine is intense. When the Earth looks like a "big, blue marble," it is less intense. Throughout history, many calendar systems have been based on the phases of the moon. The months of the Muslim calendar are determined by observations of the hilal, the moment at which the thin crescent moon first becomes visible. This marks the start of a month. Traditionally, and today in Pakistan and Jordan, hilal is determined by actual observation and can be affected by weather and other factors. When following the traditional method, it is not actually possible to be certain precisely when future months will begin. In most Muslim countries, actual observation has been replaced by astronomical rules. Rocks on the Moon are magnetized, yet there is no magnetic field there today. In one new proposal, researchers at the University of California have suggested that the moon's solid-rock middle layer, called its mantle, stirs up its liquid iron core. The researchers believe this happens because the moon's core and its mantle rotate around slightly different axes, and the boundary between them is not quite spherical. The strength of this stirring is determined by the angle between the core and the mantle, and the distance between the Earth and the moon, because the tidal forces from the Earth causes the moon's mantle to rotate differently than the core. Her phantom lover in the whole world's sight. While the Moon of Earth is the best-known satellite of any planet, other planets in our solar system also have moons. Earth has the least number of moons (one), while Jupiter has sixty-two. The first extraterrestrial moons to be discovered were the four Galilean moons (Io, Europa, Ganymede, and Callisto). Next to these, Earth's Moon is one of the largest, but Jupiter and Saturn have moons in orbit about them that might qualify as planets if they orbited the Sun instead. There are at least 182 natural moons known to exist in our solar system, counting those which are in orbit of dwarf planets. Most moons in the solar system are no larger than typical asteroids. They are of irregular shape, have light and variable surface gravities, and are often unstable in their orbits. Phobos and Deimos, the moons of Mars, fall into this category. Earth's own moon is an example of a dwarf planet-sized moon. These moons are so large that their own self-gravity forces them to collapse into spheres or spheroids. Some of them, like Ganymede and Titan, are larger even than the planet Mercury. Earth's moon was, of course, known to the ancients, but the remaining dwarf-planet-sized moons were generally the first to be discovered in orbit around any given primary. Galileo Galilei discovered the first four of these in orbit about Jupiter early in the seventeenth century; Christiaan Huygens then discovered Titan of Saturn later in that same century. The crescent moon is an internationally recognized symbol of Islam. It appears on the flags of several Islamic nations. It also forms part of the official emblems of the International Red Cross and Red Crescent Societies. ↑ 1.00 1.01 1.02 1.03 1.04 1.05 1.06 1.07 1.08 1.09 1.10 1.11 1.12 "Moon Fact Sheet," NASA, April 19, 2007. Accessed May 3, 2008. ↑ 2.0 2.1 2.2 "Planetary Satellite Mean Orbital Parameters." JPL, NASA. Accessed March 25, 2008. ↑ 3.0 3.1 "Planetary Satellite Physical Parameters." JPL, NASA. Accessed March 25, 2008. ↑ 4.0 4.1 4.2 4.3 Humphreys, D. R. "The Creation of Planetary Magnetic Fields." Creation Research Society Quarterly 21(3), December 1984. Accessed April 29, 2008. ↑ The same theory suggested that the planet Mercury had a similar locked rotation due to gravitational forces from the sun, such that the same side of Mercury always faces the sun. In fact, that is false. Mercury's tidal locking is incomplete and it does not always present the same face to the sun. ↑ NASA Measuring the Moon's Distance, LPI Bulletin, No. 72, August, 1994. ↑ NASA, Apollo Expeditions to the Moon, Chapter 15.2. ↑ Sarfati, Jonathan, The moon: the light that rules the night, Creation 20(4):36–39, September 1998. ↑ David, Leonard. "Lunar Crash of 1953: Impact Crater Identified." <http://www.space.com>, December 14, 2002. Accessed January 16, 2008. ↑ Hecht, Jeff. "New crater revives Moon mystery." <http://www.newscientist.com>, January 11, 2003. Accessed January 16, 2008. ↑ Henderson, Thomas H. "Do heavily cratered planets and moons demand an old age for the solar system?" Tom Henderson's Creation Resources, July 25, 2003. Accessed March 25, 2008. ↑ Faulkner, Danny. "The Current State of Creation Astronomy." Proceedings of the Fourth International Conference on Creationism, Creation Science Fellowship, Pittsburgh, pp. 201–216, August 3–8, 1998. Hosted at Institute for Creation Research. Accessed March 25, 2008. ↑ Faulkner, Danny. "A Biblically-based cratering theory." Technical Journal (now Journal of Creation), 13(1):100-104, April 1999. ↑ Humphreys reasoned that the higher the magnetic dipole moment of the samples, the earlier in lunar history they were formed. ↑ Child, Francis James (1860), The English and Scottish Popular Ballads, No. 58; the ballad is thought to refer to an actual event of the year A.D. 1290. This page was last modified on 22 April 2019, at 10:50. This page has been accessed 112,678 times.